Nearly three years after winning a competition to design a residential building with units smaller than 400 square feet, Carmel Place is on the verge of completion. Located in Manhattan’s Kips Bay neighborhood, the building is the first micro-apartment development in New York City. Its 55 units range between 265 and 360 square feet, and market-rate units cost between $2,650 and $3,150 a month. 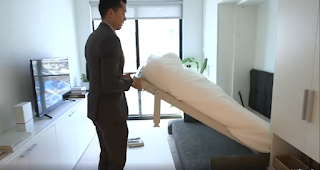 Since 1987, New York has required units to be 400 square feet or larger, but the city made an exception for this project — which was pitched as a solution to the lack of affordable living options for singles who want to live in Manhattan by themselves. Tobias Oriwol, project developer for Monadnock Development, told INSIDER that the units are specifically designed to make the most out of their limited square footage. The ceilings are nine-feet, six-inches tall and the units have double windows with Juliet balconies, giving the space an airy feel. In addition, the bed folds out of a wall, the closet extends into the apartment, and a tiny desk converts into a 10-person dining table. “This is 302 square feet, and it’s 302 usable square feet,” Oriwol said. There are both furnished and unfurnished units in the building, and Wi-Fi and cable are included in the rent. A 302-square-foot unit will rent for $2,750 when the building is completed in February of 2016. The building started leasing its market-rate units at the end of November. Its 14 affordable housing units — which are reserved for tenants with income limitations — rent for around $950. Sixty thousand people applied to live in those units, Oriwol said.